Ah those childhood memories and the awesome times spent with playdough and Lego. Childhood is for fun and games, childhood is for making memories that will go with you a long way, childhood is for rocking that small paper boat on the stream during a rainy day. Childhood is about toys. Be it action figurines or barbie dolls, be it miniature functional vehicles or strollers/prams for infants, you’ll get accessories and toys across all brands available at amazing prices only at HappySale. Avail deals and discounts from Firstcry, Giftease, Hopscotch, Elitify and more using offers on toys and accessories from HappySale. Do you have a naughty nephew or niece whom you promised some cool gifts but are now hesitant after looking at the price? Worry no more! Be the awesome uncle or aunt and get the little one their gifts without compromising on the quality all the while avoiding a burn in your wallet! Verified on 22/4/2019 . Shop for the best collection of educational toys online and get at a best price starts at Rs 150. Look on to the website where you can choose from various products and make avail of this best deal. No discount offers required to get this deal. Get now! Verified on 22/4/2019 .. Shop now and get upto 60% off on Toys that are listed on landing page. Choose from different brands, discounts, and price ranged products. No coupon code is required to avail this offer. Shop with Happysale online deals and save on your online shopping. Happy Shopping - Happy Saving. Verified on 22/4/2019 . 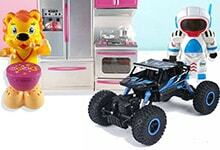 Get upto 30% discount on action toys for kids at Green Gold Store. No minimum purchase is required to avail this offer. Available in various colors and models. Shop today. Get flat 30% off on Animal planet toys. Choose from different animal toys like dog, fish, tiger, monkey, turtle and more. No coupon code required. Buy kids fashion, toys and other kids products at Craftsvilla online shopping store. Shop here for kids ethnic wear, toys, Doraemon storage box, portable infant seat, baby carrier Insert, door stoppers etc and get upto 69% discount. Purchase today. If you have a child at home then you would certainly get him or her best toys so that your little one keeps busy. And today, for that you don’t essentially need to walk into a store in a hyper market and hop from one store to the other selecting the toy with the best package. The online world takes care of most things. And if you want to buy the best toys for your little one within your budget you can make the most of the toy offers that are available online. Wondering where to get the best deals from? HappySale is a popular name and lists down some of the best deals and discounts. Doesn’t matter if your little one is an infant or is pre-school, when you browse for the toy offers online you will come across several deals and discounts for children of all age group. So from the dolls and stuffed toys to baby bicycles and perambulators and even mechanized robots, scooters, cars and dolls and the like, you will get it at the best price possible. So simply keep browsing and you will be able to get the best deal possible. When you make the most of the toy offer codes you have the chance to select deals and offers from some of the best brands in the business such as Firstcry, Hopspotch, Elitfy, Giftease and many more. Each of these brands today has made a positive impact on their customers and is constantly designing deals for the new customers and existing ones as well. So you can expect the best offers on promotional discounts, cashback offers and site wide deals. In addition to that, you can also find some of the best buy 1 get 1 free offers that will help you to get your friend s make their first purchase for their children’s toys and so on. Sometimes the best clearance sales also help you save more. To be able to make the most of the toy offers of the day, it's a smart call to keep checking out and browsing through HappySale as this website lists down only the real and the latest offers for you. Hence, all you have to do is read the deal descriptions, know it well and activate it prior to the expiry date.